The introductory African and African American Studies course that was once one of the most popular classes on campus is attracting only around 20 students this year, a significant drop that is likely the result of the departure of former Fletcher University Professor Cornel R. West ’74. When West, who left for Princeton in 2002 after a bitter dispute with University President Lawrence H. Summers, taught Afro-American Studies 10, “Intro to Afro-American Studies,” he attracted hundreds of students who packed into Harvard’s most cavernous lecture halls to hear him lecture. Af-Am 10’s students and the two professors team-teaching the course, Professor of Government Michael C. Dawson and Professor of the History of Science and of African and African American Studies Evelyn Hammonds, are now accommodated comfortably in a lecture room in Sever Hall. 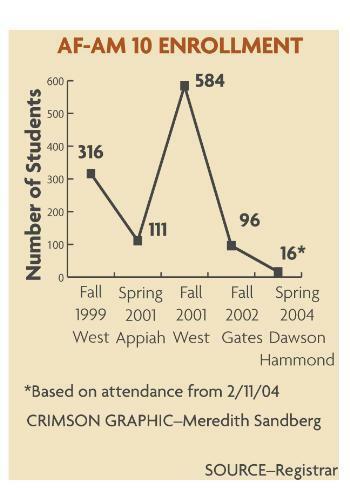 Enrollment has dropped quickly since fall 2001, when West last taught the course and enrollment hit 584. In fall 2002, when W.E.B. Du Bois Professor of the Humanities Henry Louis “Skip” Gates took over in the wake of West’s departure, 96 students were enrolled. Dawson said he thought the declining interest was due to West’s absence. “Cornel West was obviously a very popular professor and a draw for the class,” Dawson said. Af-Am 10 is a required class for students who wish to concentrate in African and African American Studies and is a pre-requisite for several departmental classes. Jason W. Norman ’05, who took the class last year under Gates, said he thought the current version was unlikely to attract large numbers of students. “Ever since Cornel West has left the numbers have constantly dwindled,” he said. “It’s just not appealing right now.” Despite the low turnout, students in the class said that so far, they are enjoying its new format. “I would definitely recommend it,” said Chimaobi O. Amutah ’07, who said that although he had expected a larger enrollment, the once-enormous class now has an “intimate” feel. “I think that the professors are very good...especially Professor Hammonds. She’s really passionate,” Amutah said. Dawson said that the class curriculum has changed to reflect his and Hammonds’ interests. “We’re in the process of rebuilding an audience for the class,” he said. Amutah said that the injection of the professors’ personal interests has supplemented the class, and that Hammonds in particular has merged some history of science into her lectures. Jon E. Gentry ’07, who said he will likely concentrate in Af-Am, added that the professors were including plenty of room for question-and-answer sessions. —Staff writer Nadia L. Oussayef can be reached at oussayef@fas.harvard.edu.